Nikolay Ivanovich Bobrikov (Russian: Никола́й Ива́нович Бо́бриков; January 27 [O.S. January 15] 1839 in St. Petersburg – June 17, 1904 in Helsinki, Grand Duchy of Finland) was a Russian general and politician. He was the Governor-General of Finland and the Finnish Military District from 29 August [O.S. 17] 1898 to 16 June [O.S. ] 1904 during the early reign of Emperor Nicholas II, and was responsible for the Russification of Finland. After appointment as the governor-general, he quickly became very unpopular and was assassinated by a Finnish nationalist. Nikolay Ivanovich Bobrikov was born on January 15, 1839, and attended the 1st Cadet Corps. Upon graduation, he became a lieutenant and served in the Imperial Guards. After which he served in the Kazan military district and as divisional chief-of-staff in Novgorod. He became a colonel in 1869. A year later he was transferred to Saint Petersburg for special duties in the Imperial guard. This gave Bobrikov access to the Imperial court. In 1878 he became a major general. In 1898, Tsar Nicholas II appointed Bobrikov as the Governor-General of Finland as well as the Finnish Military District. Unification of the Finnish army. Restricting the power of the Minister–Secretary of the State. Introducing of a special programme for dealing with cases common to the Empire and the Grand Duchy. Adoption of The Russian language as the official language open the Senate, education and administration. Bobrikov quickly became very unpopular and hated in Finland as he was an adamant supporter of the curtailing of the grand principality's extensive autonomy, which had in the late 1800s come into conflict with Russian ambitions of a unified and indivisible Russian state. In 1899, Nicholas II signed the "February Manifesto" which marks the beginning of the first "Years of Oppression" (sortovuodet) from the traditional Finnish perspective. In this manifesto the Tsar decreed that the Diet of the Estates of Finland could be overruled in legislation if it was in Russian imperial interests. Half a million Finns, considering the decree a coup against the Finnish constitution, signed a petition to Nicholas II requesting to revoke the manifesto. The Tsar didn't even receive the delegation bringing the petition. In 1900, Bobrikov issued orders that all correspondence between government offices was to be conducted in Russian and that education in the Russian language was to be increased in schools. The Finnish army was abolished in 1901, and Finnish conscripts could now be forced to serve with Russian troops anywhere in the Russian empire. To the first call-up in 1902, only 42% of the conscripts showed up. In 1905, conscription in Finland was abolished since Finns were seen as unreliable. In 1903, Bobrikov was given dictatorial powers by the Tsar so that he could dismiss government officials and close newspapers. 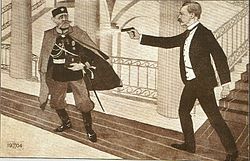 A drawing of the assassination by an unknown author. Governor-general Nikolay Bobrikov's casket at the Eastern Orthodox Uspenski Cathedral in Helsinki, before being transported to St. Petersburg. On June 3, at 11:00 am, in the Senate building on the second floor staircase, an attempt was made on the life of the Finnish governor-general and commander of the troops, Adjutant-General N. I. Bobrikov; an official of the main school management in Finland and a former employee of the Senate, the son of a former senator, Yevgeny Shauman fired three shots at the governor-general. One bullet hit the neck is not dangerous, another contusil, hitting the order, the third - in the stomach. On giving first aid to a Russian doctor, the governor-general was moved home. Doctors recognized the need to produce an early operation. The wounded man took communion. After the abdomen, the bullet was removed. Many blood clots have been found; part of the small intestine wounded by the bullet was removed. The wounded man died quietly on the night of June 4th. The criminal shot himself on the spot. ^ a b c d Kauffman, George B.; Niinistö, Lauri (1998). "Chemistry and Politics: Edvard Immanuel Hjelt (1855–1921)". The Chemical Educator. 3 (5): 1–15. doi:10.1007/s00897980247a. Wikimedia Commons has media related to Nikolai Ivanovich Bobrikov.